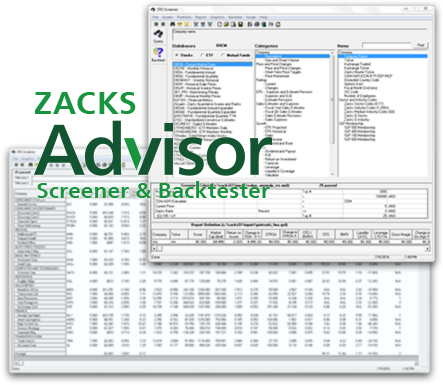 Zacks Screener plug-in for Zacks Advisor Tools enables you to apply an array of Zacks’ proven screening strategies, and backtest a custom screen to evaluate its success before you implement it. Our institutional grade screener lets you start with everything you like in a stock, and narrow down more than 8,000 choices to the strongest picks. Then evaluate your strategy by backtesting it as far back as 2000. Identify low P/E stocks that reported EPS during the last 15 days, had earnings surprises above industry median and upward estimate revisions. Search for mid-cap stocks in specific industries that are 30% off their highs. Uncover stocks whose earnings growth is above their industry median and whose P/E and P/B are below their industry medians. Perform searches like these in seconds. After saving your criteria, generate and maintain a list of followed companies. Zacks Screener integrates seamlessly with Zacks Advisor Tools. To see all it can do, click the button to add a free trial to your Zacks Advisor Tools account. As always, if you have any questions, please don’t hesitate to contact us at 888-691-0681 or ZRSsales@zacks.com. * Investars Top 5 ranking for quantitative firms and major fundamental firms/buy Index for entire coverage universe 1/1/10-12/31/2015. Investars evaluates investment research firms to help investors measure the value of the firms’ research through a robust set of analytic performance measurement tools. Past performance is no guarantee of future results.